"SaBRA! SaBRA! SaBRA!" The chants of the crowd made the Togemon smile as she entered the "ring"-- actually just a flat area out in the desert, marked off by a square made of rocks. The cactus-like Digimon adjusted her bright red boxing gloves and looked out at the other Digimon gathered to see her fight. The group wasn't all that large; not too many Digimon lived in the Digital World's harsh desert. There were a few Gotsumon and two Aquilamon, along with a handful of Ankylomon and a few lone Digimon of other species. Sabra wasn't even from that particular area, but her reputation as a skilled fighter had preceded her on her tour of the desert, boxing to earn a living. Judging from the cheers, she was the crowd favorite although her opponent was a local Ponchomon. "No one really likes Nopaltzin," one of the Gotsumon had explained to Sabra the previous night, when she was gathering information on the Ponchomon. "He's not a bad guy, but he's annoying-- always playing practical jokes on us and teasing us. He calls me Rockhead," the small Digimon had finished mournfully. Sounds like this Nopaltzin needs putting in his place, Sabra had thought at the time. Now, as she saw the Ponchomon approaching, she decided she had been right. Ponchomon were ghostly Digimon who resembled legless Togemon wearing ponchos and sombreros. Like most, this Ponchomon wore two maracas stuck in the brim of his hat, but instead of the normal blue, his were a deep violet. The color startled Sabra, who wore a ribbon of that exact shade tied around the wrist of her right glove. Even though he floated through the air, Nopaltzin seemed to saunter as he approached, shaking his gloved fists in the air like a champion and sticking out a long red tongue at the Digimon who booed him. "Yeah, yeah, you'll change your tune once the fight starts, amigos!" Nopaltzin yelled to the crowd, moving to his corner of the ring. Under his red leather-wrapped gloves, the Ponchomon's bony arms were covered in bandages like a mummy. Sabra was fairly young and had never met a Ponchomon before; she was taken aback at how much he looked like her but. . . well. . . dead. Don't let him creep you out, she told herself, hopping from one large, prickly green foot to the other. He's just a cocky Digimon like all the rest, thinking he can beat you 'cos you're a girl. Seeing the two challengers were ready, the referee, a single Meteormon, scrambled to the center of the ring. "Let's get ready to rumblemon!" the metallic Digimon cried, striking himself in the head with a large stick he carried. A sound like the ring of a bell issued from the Meteormon's vibrating head, and he staggered out of the way a bit dizzily. Sabra darted forward, eager to start the fight. "Buenas noches, muchacha," Nopaltzin smirked as he came to meet her, gloves raised. Sabra struck at him with a fist, but the Ponchomon easily darted out of the way, still with a toothy grin. "Tequila Knuckle!" Nopaltzin cried, driving a punch right at Sabra's face. She drew back, avoiding the full force of the punch, but she felt the leather of the Ponchomon's glove make contact with the prickly green flesh between her hollow eyes. It didn't hurt much and only served to fuel the Togemon's anger. "Coconuts Punch!" Sabra jumped forward again and punched at Nopaltzin several times. The latter of her punches connected, and she finished the move by slamming both fists down on Nopaltzin's hat, just below his sombrero. The force of the blow drove him back and stunned him-- but more importantly, it knocked off his sombrero. The hat flew through the air to land on the ground behind him, the two maracas slinging off in opposite directions. The crowd fell into a shocked silence. 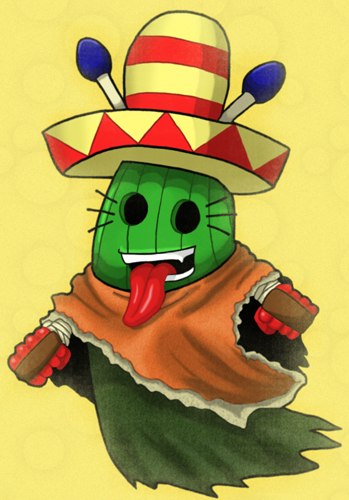 . . then erupted in laughter at the now hatless Ponchomon. Sabra stared, her carved mouth twitching in a suppressed smile. Under the hat, the Ponchmon had hair just like hers-- orange and spiky! However, where a Togemon's hair grew in a single tuft at the center of its head, Nopaltzin's was a thick shock of slightly darker orange which covered the green dome of his top. In spite of herself, Sabra thought he looked kind of cute. "Cactus Bat!" bellowed the Ponchomon, lowering his prickly head and charging at her. "Oof!" Sabra cried as the tufted done of Nopaltzin's head connected with her midsection. She staggered backwards, nearly knocked off her feet, at the force of the blow. "Nngh, you-- you big dork!" Sabra groaned as she regained her balance and shook herself, then raised her fists again. She cried "Prickly Bang Bang!" and long cactus spines poked through her gloves as she pummeled her opponent. The needles didn't do too much damage thanks to Nopaltzin's thick poncho, but he still cringed and grumbled, "Ow! Crazy woman! Just give up!" "You're the crazy one if you think I'm a quitter!" Sabra growled. "Mach Jab!" Nopaltzin reeled as she punched him again, but then he straightened himself up and scooped his sombrero off the ground, plunking it firmly down on his head. "I've had enough of this!" Nopaltzin tensed up, and a strange green light began to glow from within him, shining out of his carved eyes. "Ponchomon digivolve to-- Phantomon!" Phantomon! Sabra was startled and, to be frank, unprepared. Her opponents occasionally evolved mid-battle, and Sabra was usually ready for them. However, she hadn't ever heard of a Ponchomon evolving-- and she hadn't expected this goofy cactus to turn into the formidable Phantomon. Nopaltzin was now completely swathed in a crimson hood and grey robe, and he carried a golden scythe bearing a chain. Two icy blue eyes stared out at Sabra from the darkness inside the hood. Nopaltzin began to swing his scythe's chain back and forth; the weight hanging from its end gained momentum and swung farther and faster with each movement. "Diabolic Star!" Nopaltzin called, suddenly lunging forward and swinging his chain upward. The weight careened toward Sabra with a force sure to knock her out if it connected. Sabra's rather clumsy Togemon body could never move fast enough to avoid the attack, but she was a skilled enough battler for her brain to shift into automatic pilot. There was just one way for her to avoid losing the match then and there-- even though she hated to take it. "Togemon digivolve to-- Lillymon!" Instantly, Sabra's body was suffused with the same green glow that had surrounded the Ponchomon. The digital data that comprised her Togemon form flowed upward to the crown of her head, where it concentrated and bloomed into a great pinkish orange blossom. As Sabra's cactus-like body dissipated, her new body formed: that of the petite, pink-clothed flower fairy Lillymon. I hate this form, Sabra thought, glaring down at her flower-petal skirt even as she used her leaf-like wings to lift into the air, easily dodging Nopaltzin's attack. The chain's weight sailed beneath her green-booted feet and crashed into the sand behind her. Sabra heard a smattering of laughter from the crowd, although she couldn't be sure what they were laughing at: her surprisingly dainty Ultimate form, or Nopaltzin's failed attack. She raised her head to glare at Nopaltzin and found her opponent staring at her. "Yeah, yeah, I know. I'm pink," she snapped. "Maybe another form will suit you better!" By not attacking as Lillymon, Sabra had conserved her energy enough to evolve again to her much-preferred Mega form. "Lillymon digivolve to-- BanchoLillymon!" While her slender body didn't change, Sabra's pink petal skirt withered and turned black, as did the blossom crown perched on her delicate head. Her green boots and gloves turned to black leather-- her wrists wrapped in the purple ribbon she had worn as a Togemon-- and her wings shifted to a deep violet color. As a crimson coat formed itself over her shoulders and back, Sabra's new weapon appeared in her hand: a green spiked yoyo with a spiny string and a Togemon's face emblazoned on its sides. The crowd of watching Digimon gasped, and then burst into applause at the site of Sabra's Mega form. Nopaltzin's blue eyes widened an instant but narrowed again. "You can't out-evolve me! Phantomon digivolve to-- Deathmon!" This time the light coming from Nopaltzin's body was a deep, bloody red. His floating, incorporeal form solidified into a stocky creature with no head or neck, only a single, huge golden eye set in its chest. Two reddish bat wings sprouted from Nopaltzin's back, and he swished a long tail. He gained muscular arms and legs with claws for fingers and toes, along with another eye in each palm. While some Deathmon were white, Nopaltzin's flesh was a deep black, so dark it seemed to absorb the light around it. The crowd was horrified, and many of them scattered. Sabra herself stared but didn't back away. She had seen more frightening Digimon before, and in fact, she didn't even find Deathmon ugly. Nopaltzin's large, shining eye was intriguing, and he had the, well, cutest little wrinkle of skin on the top of his tail. Something about him still clearly identified him as the goofy Ponchomon Sabra had met first. A little smirk crossed Sabra's face as she raised her hands. "Twin Petal!" she cried, executing her Mega form's version of Lillymon's Flower Cannon attack. Sabra fired a ball of energy from her cupped hands, and the missile struck Nopaltzin in the belly, just below his eye. Nopaltzin roared with pain, reeling backward and thrashing his tail. "Death Arrow!" Nopaltzin yelled as he lifted his own hands and shot arrows of energy from the eye on each palm. One arrow grazed Sabra's shoulder, but the other missed her entirely. She winced at the sting of her shallow wound and drew back her right hand, the one holding her yoyo. "Absolute Territory!" With a nimble flick of her wrist, Sabra launched the yoyo on its string. It swung in a wide arc, homing in on Nopaltzin-- where it bonked the Deathmon squarely in his huge golden eye. "OWWWWWW!" Nopaltzin clapped both hands over his eye as tears streamed from it, running down his arms to drip off his elbows. The Deathmon wobbled on his feet then keeled over on the ground with a thud that raised small puffs of sandy dust. Sabra swallowed hard and darted forward using her wings, peering down at Nopaltzin. She hadn't meant to hurt him that badly. . . .
As Sabra and the remnants of the crowd watched, Nopaltzin's body broke apart into individual bits of data; then he devolved back to his Ponchomon form. His boxing gloves were still clamped over his face, but when he slowly lowered them, he was unhurt. He looked up at Sabra a bit dizzily-- then stuck out his very large tongue at her. "Fine, fine, you win," he sighed. Sabra let out a shaky sigh of relief now that she knew he was all right. She had used up a lot of energy herself on her two attacks, and as she relaxed, she devolved into Togemon again. "Yeah, well. . . good fight," Sabra mumbled. She reached out a boxing glove to her opponent. Nopaltzin looked at her hand then took it in his own glove, letting her help him up. Once he was floating upright again, Nopaltzin shook Sabra's hand firmly and straightened his sombrero. To the surprise of both cacti, the rest of the Digimon watching broke out into a cheer. "So, uh. . . can I buy you a drink?" Nopaltzin asked abruptly. When Sabra stared at him, his bristled his needles defensively. "No one's ever beat me as Deathmon before. I owe it to you." Sabra hesitated, remembering what the Gotsumon had told her: Nopaltzin was annoying and nobody liked him. Nobody likes him. . . but maybe that's why he's annoying. He's trying to make friends, Sabra thought. Not that she was that big on making friends herself, but. . . she did sort of like Nopaltzin. Only sort of, of course. "Okay," she acquiesced. "I'd. . . like to hear about how you learned to evolve to Deathmon." Nopaltzin grinned, exposing a lot of very sharp white teeth. "And I'd like to know where to get a cactus yoyo!" Sabra smiled back; then the two cactus Digimon headed to the little desert town's single watering hole, together.